Welcome to the JVNP 2.0 Update featuring a JV request courtesy of fellow JVNP 2.0 Partners Jamie Lewis + Grant Baker (IMWithJamie 3.0 launch JVZoo affiliate program JV invite), Buzz Builders (Daven Michaels – Social Sonic, Tanner Larsson – Ecommerce Evolved Book Launch launches) and More … in Today’s three-peat time – get on the winning JV team edition. 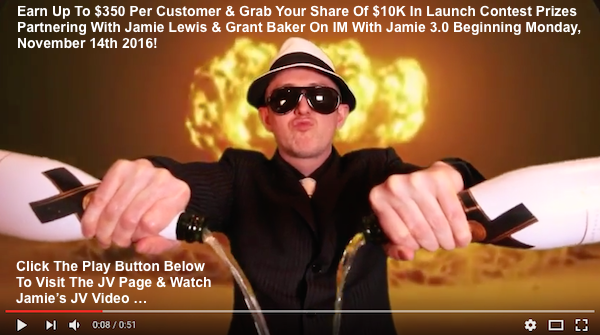 Fellow JVNP 2.0 Partner.. feast your eyes on IMWithJamie 3.0..this is going to be THE OFFER in IM this Fall on JVZoo. With over millions in sales and hundreds of thousands paid to affiliates in previous IMWJ launches, you already know it’s a winner. But, these guys have decided to sweeten the deal and offer up $10,000 in crisp greenbacks for their beloved JVs. Short on time? Jump ahead to the JV Page. So.. in case you’ve been living under a rock for the past 5 years.. I’ll give you the scoop. 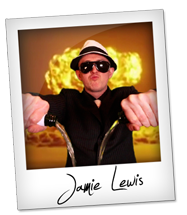 Jamie Lewis STARTED the webinar game in IM.. way back in 2011..and unlike other “gurus” he has continued to host his own webinars, LIVE, twice per week for the past 5 years. Over 500 of them. And my refunds stay low, in the 2% range, because he delivers HUGE VALUE to his students. They get two webinars, twice per week, for the first 8 weeks at just $27. Plus, access to every webinar Jamie ever recorded and a whole treasure trove of resources and goodies to keep them happy and make them real money. And best of all, all the strategies REALLY WORK and are unique to Jamie. Jamie is like a mad genius marketing scientist of sorts! Not really, but you get the point! He knows his stuff and your customers will stick on with a proven brand that converts like dynamite! You stand to gain up to $350 a customer with the powerhouse Front-end and 3 upsells which have been tested to perfection your traffic is bound to love again and again. It’s up to you how BIG you want to go.. the sky is the limit my friends! >>> Watch Jamie’s JV video. This is an easy one folks. $10K up for grabs on JVZoo.. and will go for 7 days from the start of the business day Monday, the 14th at 10am to the end of the business the following Monday, EST. Get yours for the taking! Because it’s converting like NEVER BEFORE and, of course, we’ve got the support on lock to fully-reciprocate on your next launches. They have tested, tested, tested to ensure only the best for you guys. So offer Jamie your support and you know he will offer you his in a HUGE way. Tired of having to beat your subscribers over the head to make a sale? Give your subscribers something they actually WANT and make up to $167 and $15 per month per customer by giving away FREE copies of my 331 page Ecommerce Blueprint. Plus $20K contest and $18K per JV in milestone prizes. Tanner Larsson – Ecommerce Evolved Book Launch JV page. The Brain-A-Thon is our flagship LIVE event that crushes it every year. The promotion window starts 2 weeks prior to the live event date of November 5th, 2016. As a reminder, last year’s event generated EPIC EPC’s of $2.76 and EPO’s of $7.91. BOOM. We look forward to cutting you HUGE checks again this year. Earn 40% commission on each $995 sale. Affiliate registration => John Assaraf – NeuroGym – 5th Annual Brain-A-Thon Live Event Affiliate Program JV page. Join our HUGE Relaunch and Raffle! Updated product with a whole new game: Prelaunch RAFFLE and squeeze page pulls prospects into our new funnel, streamlined to CONVERT! Full Affiliate Resources, including ready-to-send prelaunch and postlaunch email-swipes. Upsells, Downsells, recurring-payment membership and much more in the pipeline. Ryan Cameron + Liam Laurie – Bearded Dragons Insider Relaunch + Raffle JV page. Got a Video or Internet Marketing list? Chris & Ken launch “Video Titan v3” on JVZoo – this Tuesday, November 8th. Sequel to 30,000+ selling JVZoo series. Earn 100% on the FE and win $5,000 JV CASH! Chris X + Ken O – Video Titan 3.0 JV page. $50,000.00 in bonus cash and prizes up for grabs, 25k for top affiliate. All-New Tube Traffic Secrets™ 2017 Edition. Bestselling product with refunds below 10%. Last launch 6.67% VSL conversions, avg. EPC $8.42 up to over $20. Earn 40% on TTS. Plus commissions on upsells, backend sales and recurring commissions. Jeff Johnson – Tube Traffic Secrets 2017 Edition JV page.